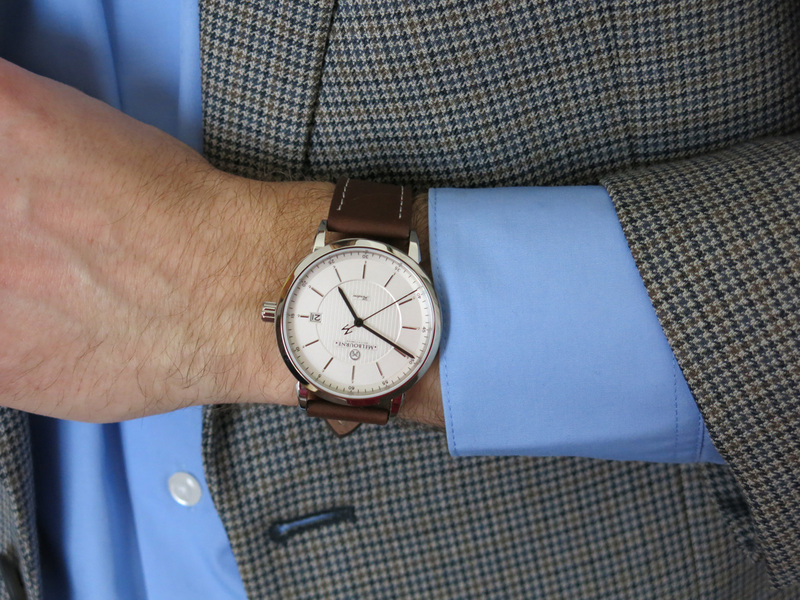 The Flinders will dress up nicely your wrist. 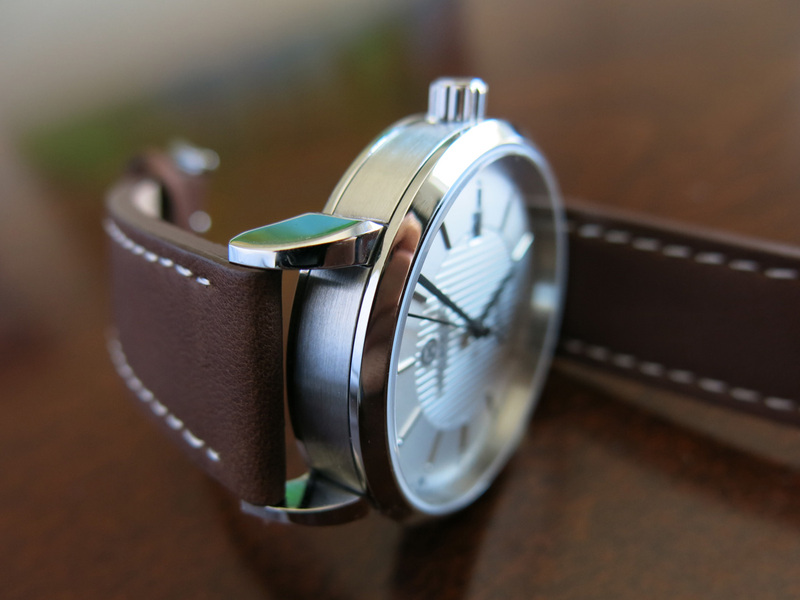 The Flinders is the first model of the Melbourne Watch Company, an Australian brand that was initially launched as a very successful Indigogo project, you can read more about it here. The Flinders has two versions, one with black dial and the other has a white dial; this review is done based on the one with the white dial and brown leather strap. price $ 525 AUD / $ 479.22 USD. The first thing that stroked me, when I opened the box I got in the mail, was the quality of the packaging. As I was opening the display case and the light hit the dial of the Flinders, I knew that this was not an ordinary piece. The dial immediately caught my attention: the details, its simplicity, yet still revealing a whole panoply of carefully executed tiny details to the observing eye, offering many pleasant surprises to its owner. The texture of the dial, its layering, the parallel line pattern at its centre, the applied polished silver indexes, are all as many traps to catch the light and take him for a play. The outer circle has small printed indexes and numerals for a more accurate time reading. The white Flinders has black hands, which offer a good contrast and readability and as an original touch, the seconds hand ends in a capital M, a reminder of the place this watch is coming from. The date window is at three o’clock, the logo is at 12, and the name of the model at six, nothing unusual. 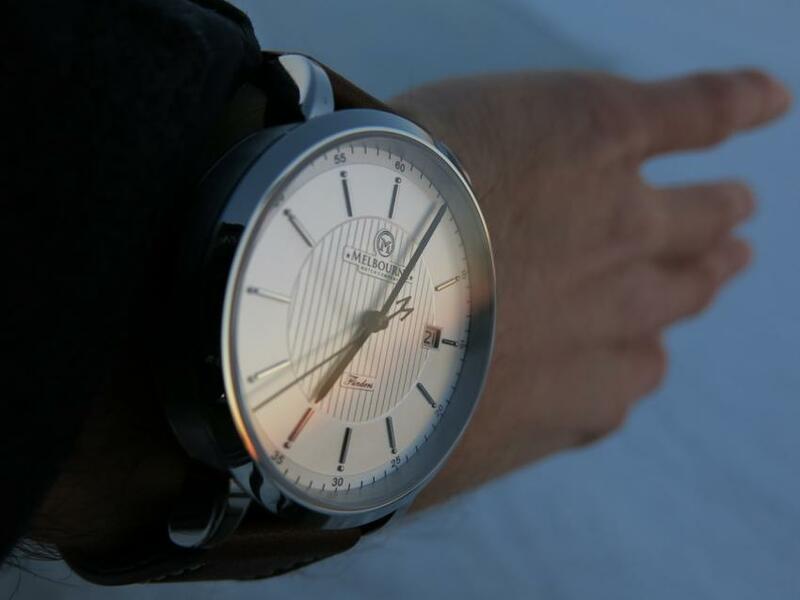 The anti-reflective sapphire crystal will let you enjoy the dial even in the most difficult lighting conditions. 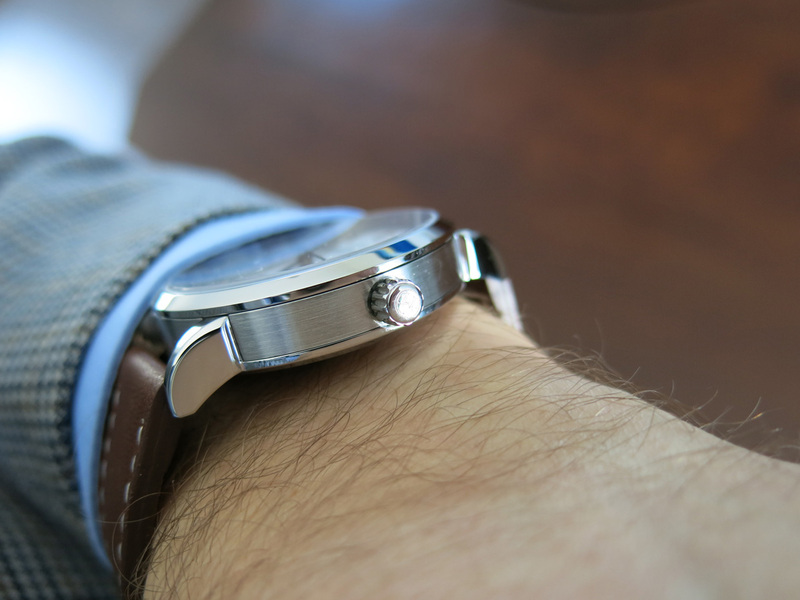 The dial is protected by an anti-reflective sapphire crystal, yet another prof that there were no corners cut in the choice of the materials going into this watch. Once you can get your eyes off the dial, the 40mm stainless steel case too has some pleasant surprises “up his sleeve”. 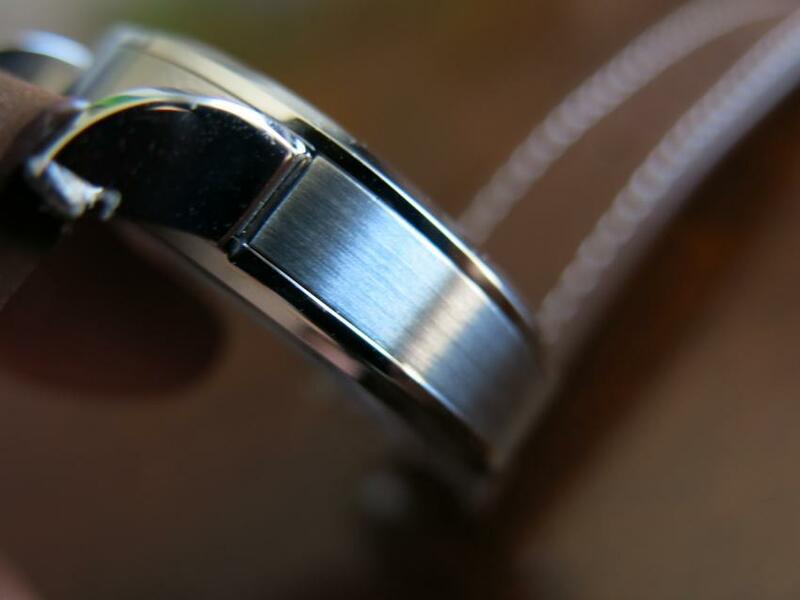 The bezel and the lugs are polished, while the middle section of the case is brushed, a subtle contrast of textures and yet another playground for the light to indulge the observer. If the bezel and the lugs are polished, the case is brushed, offering another occasion for the light play on the surface of Flinders. 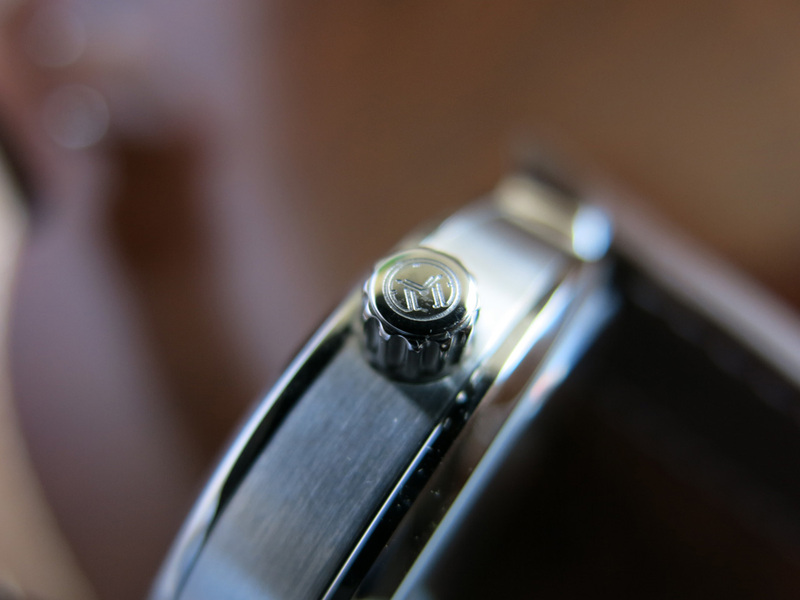 At 9.8 mm height, the case is not a slim watch, nor it is oversized, it is just the right size for a dress watch to easily slip under the shirt. I don’t have large hands or thick fingers, but I had a bit of trouble pulling out the crown to adjust the time. I would suggest making the base of the crown in a way to facilitate the adjustment of time. 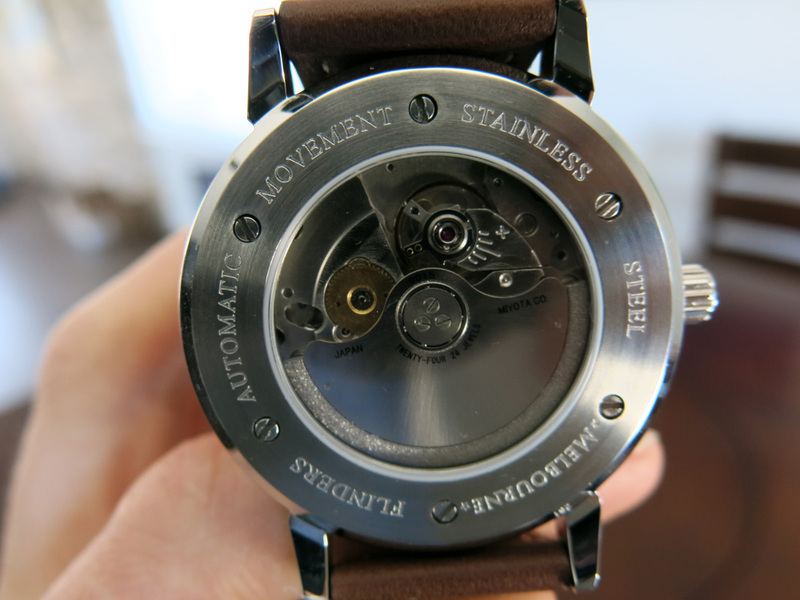 Other than that, winding the watch or adjusting the time is easy, due to the well machined carvings all around. 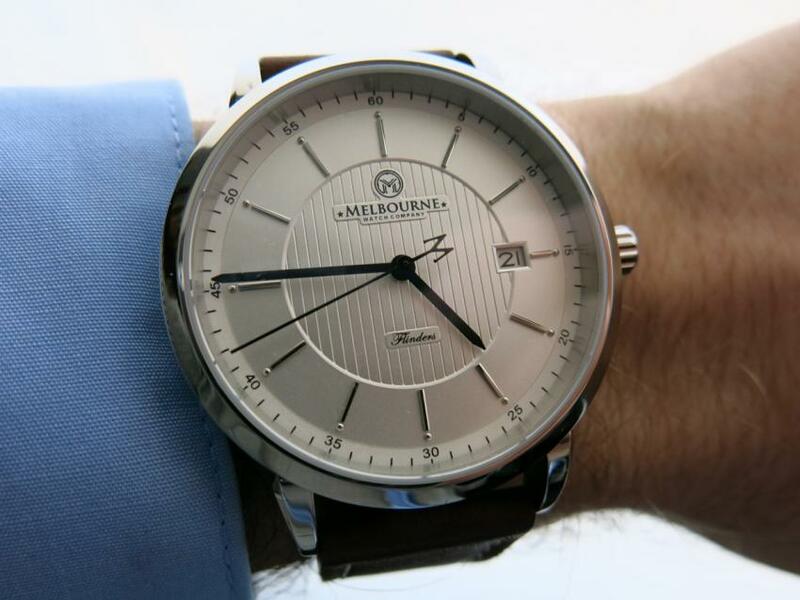 As a graphic designer, I really like the Melbourne Watch Company logo. 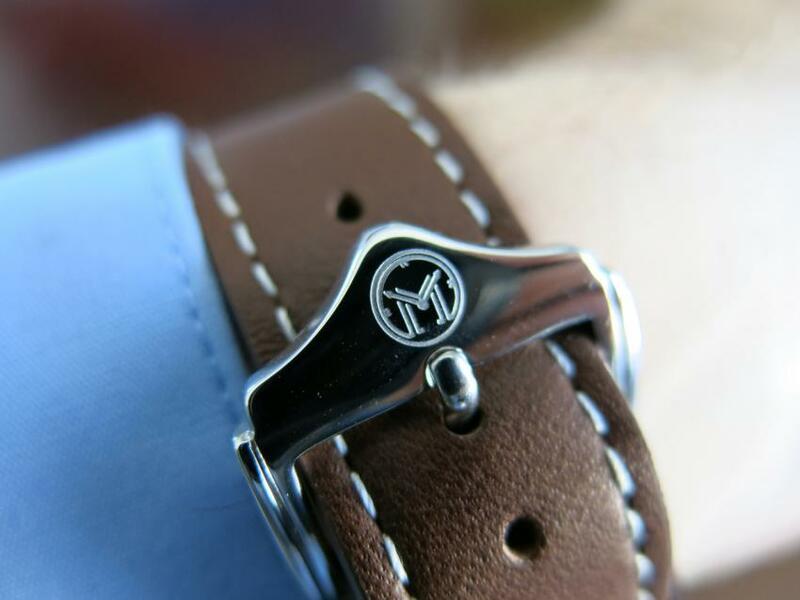 The M in a circle, alludes to a watch at 10 past 10, quite an ingenious idea. Bravo! Inside the Flinders, you’ll find ticking a Miyota 9015 automatic, 28,800 bph with 42 hours of power reserve. This is a solid choice, nothing to worry about; it keeps excellent time and the hands are sweeping really smoothly, more candy for the eye. 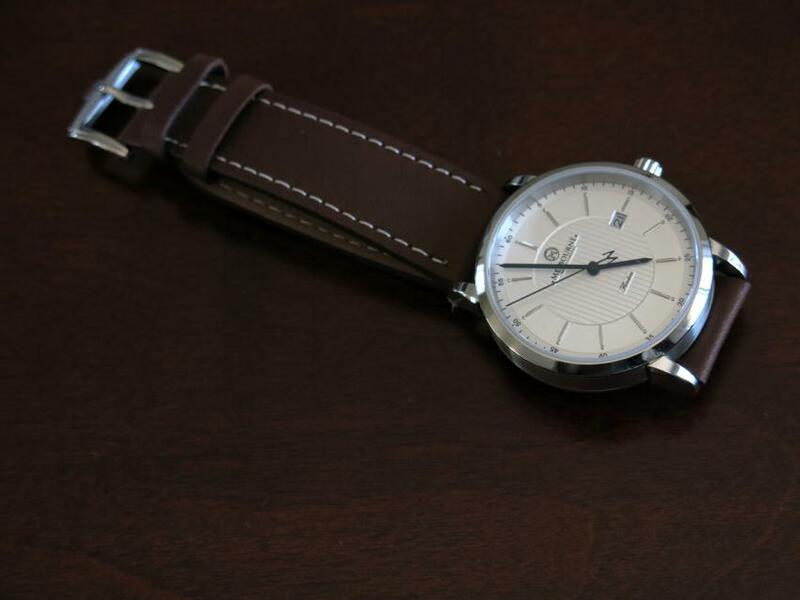 The white Flinders comes with a really comfortable and good quality brown leather strap. 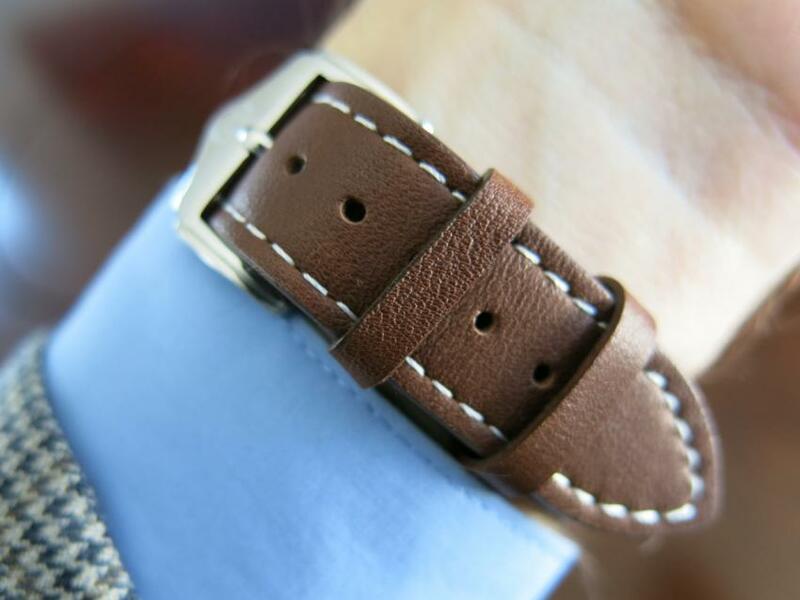 The genuine leather strap ads to the dressy appearance of the watch. I found the strap to be very comfortable, easy to put and it feels good. Not a very soft leather, but I don’t mind it, feels more masculine. 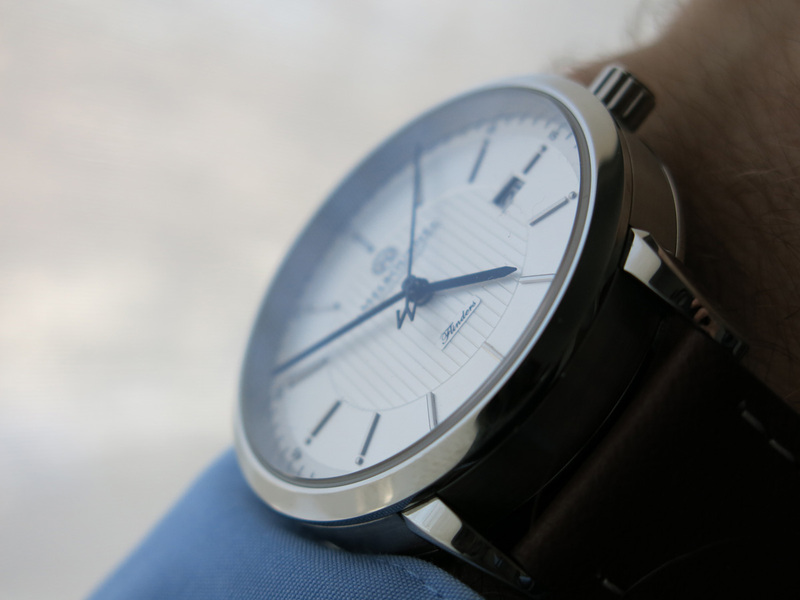 Overall, the Melbourne Watch Company did a great job with the Flinders. I showed to several people and the feedbacks I got were all positive. 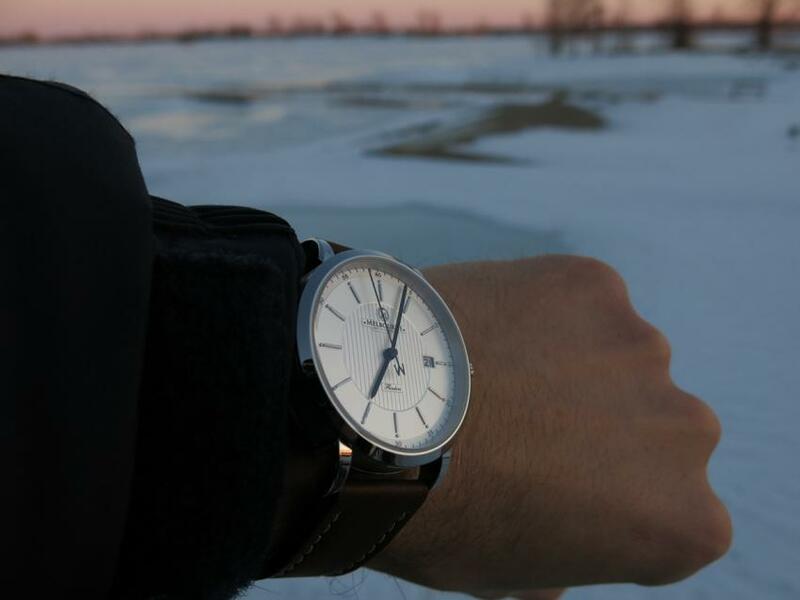 It’s a classic watch that is easy to like and if I would make a gift, I would be safe with the Flinders, as it seems to work for everyone. All these little details that I discovered, one by one, gave me an overall good feeling about it and it is one of those watches separation is not easy. 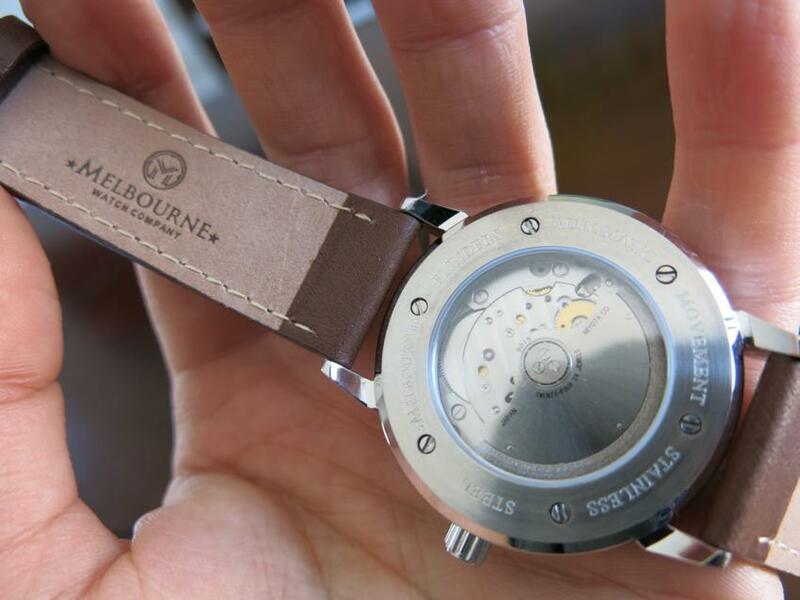 I send it back, knowing that Melbourne Watch Company is already working on a new model, the Hawthorn that is expected to be released in May. There are very few things, that I could reproach to the Flinders and these are mostly minor details, not really deal-breakers for me. As I mentioned earlier, the crown is not easy to pull out, you need good nails for that. I took the Flinders to the theatre and there was a moment in the play where, not a nice gesture of me, but I wanted to check the time and in the dark, I missed the lume. Actually, the half spheres next to the indexes, initially they were supposed to have lume, but unfortunately the final production model did not get them. I don’t know for you, but it’s not the end of the world, I could live with it. If something goes wrong, the Flinders comes with 12 months manufacturers warranty. At $ 525 AUD / $ 479.22 USD, it’s a great value, you can’t go wrong with it. No matter the angle, the Flinders is appealing to look at. The logo of Melbourne Watch Company engraved on the polished buckle. The Flinders at sunset, or Melbourne in Canada.